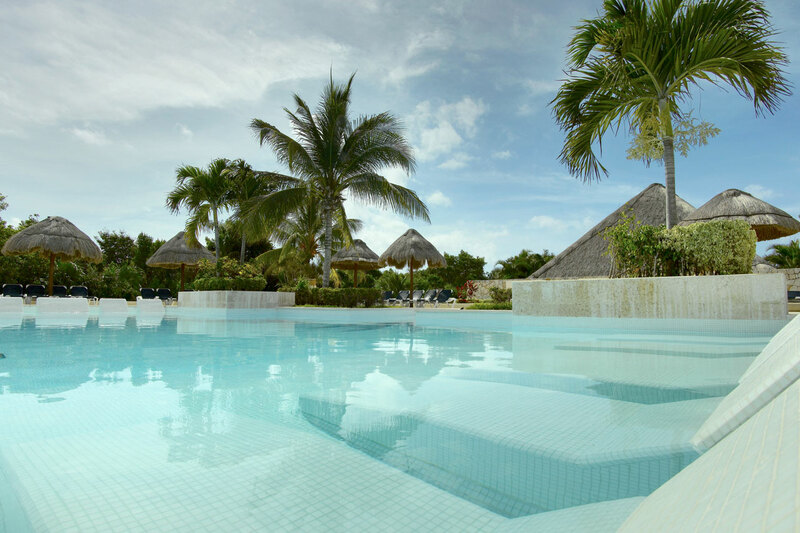 TRS Yucatan is a 5-star luxury hotel that offers a calming retreat within the lively Riviera Maya. TRS Yucatan Hotel is the perfect choice for couples and adults who want to enjoy privacy and personalized service whilst also offering unlimited access to a wide array of top quality services. 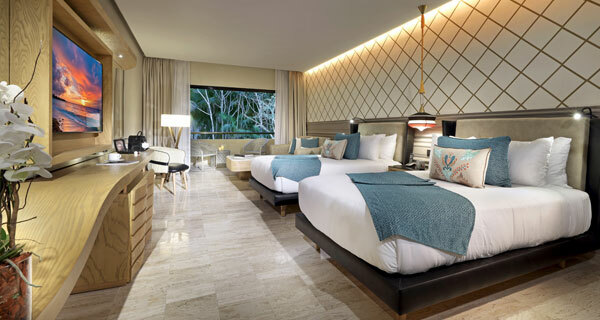 TRS Yucatan Hotel pays homage to the indigenous flora and fauna, and the immaculate grounds are complemented by the elegant architecture and decor. From the moment guests check in, they get lost in the magic of TRS Yucatan Hotel, where worries disappear faster than the ebbing tide. From the luxurious modern suites, it’s just a few steps to the exclusive adults-only pool; and from there, a couple of strokes to the swim-up bar. 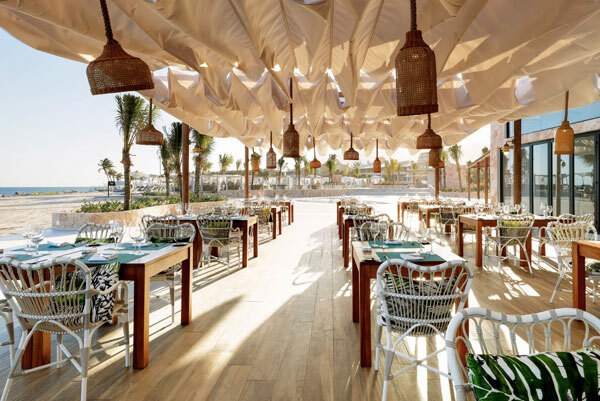 Enjoy the cool, clear water as you sip exotic cocktails and soak up the bright Mexican sunshine. 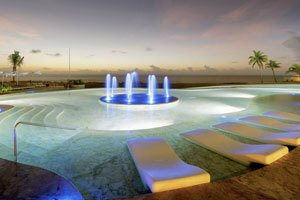 TRS Yucatan Hotel prides itself on letting guests put their feet up and bask in the relaxation they deserve. TRS Yucatan Hotel offers a 24-hour butler service to cater to your every need, your stay can be exactly what you dreamed it would be, and there is an array of bars and restaurants within a stone’s throw of the suites. Golf carts are available to whisk you away to any of the 5-star facilities or activities you wish to enjoy, including snorkeling, kayaking and paddle surfing. 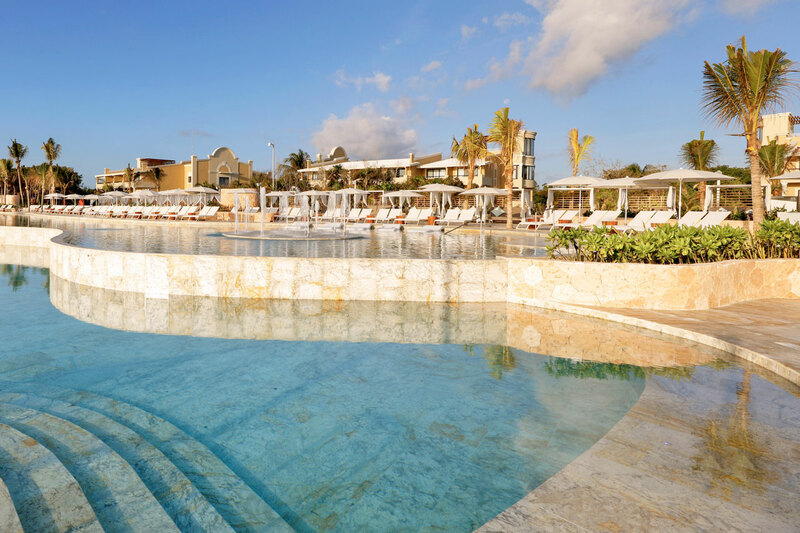 Visit the infinity pool with Balinese beds, overlooking the azure Caribbean waters and white sands, head to the adults-only beach club, Helios, for a day of fun in the sun or sunbathe on the pristine VIP beach. As dusk falls, enjoy dining at the Chic Cabaret & Restaurant - one of the à la carte restaurants - which offers dinner and a show, or head to the El Gaucho for some traditional Argentine cuisine. 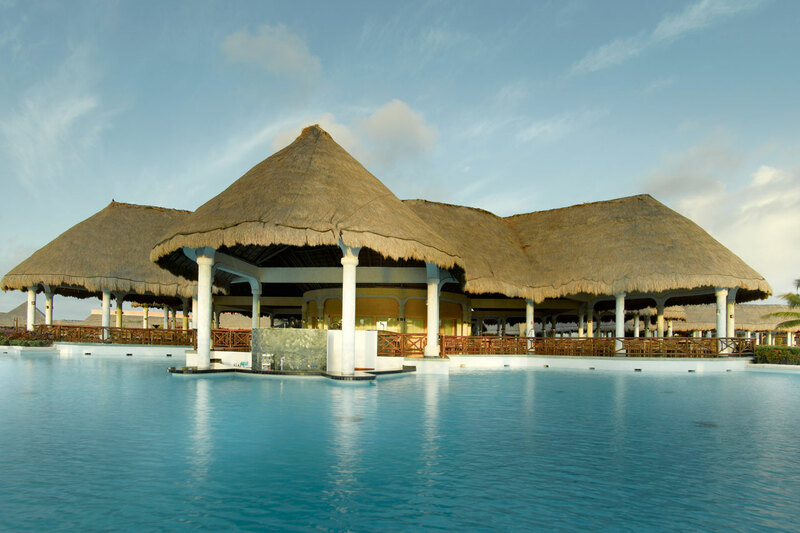 The hotel’s exquisite 4 pool bars, including La Terraza bar, are perfect for sipping classic cocktails or a glass of bubbly. Never worry about a booking, as the Grand Palladium Hotel Group smartphone app allows you to reserve your spot in a few taps of your finger. After dinner, try the nightly canoe tour to truly soak up the silence and tranquillity. Before heading back to reality, allow some time for the Zentropia Spa & Wellness center, where guests can enjoy the hydrotherapy zone or try a refreshing fruit drink prepared in the spa’s healthy juice zone. 454 fully-fitted suites with 24-hour room service. 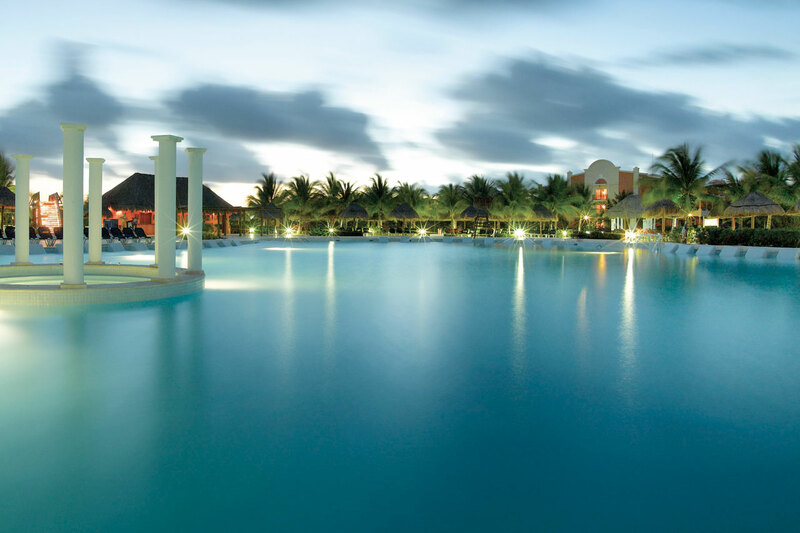 6 à la carte restaurants and 6 bars exclusively for guests staying at TRS Yucatan Hotel. 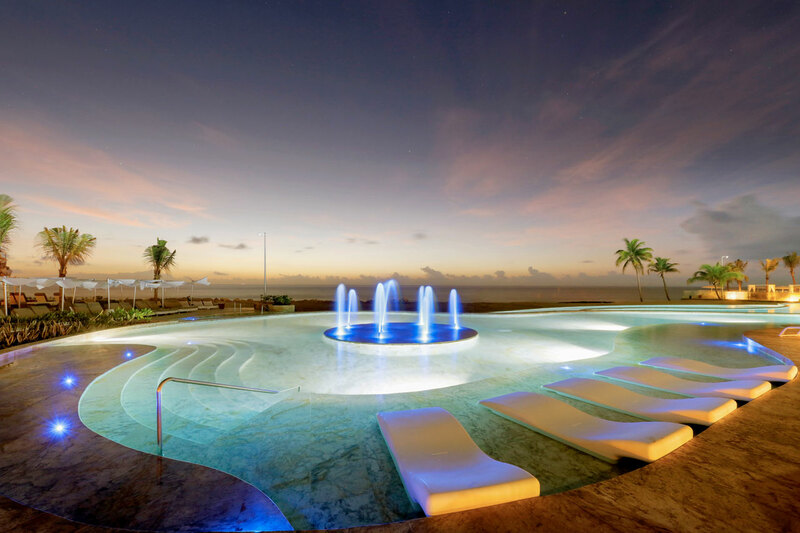 Premium VIP beach area with loungers and waiter service, as well as a first-class Spa & Wellness center. 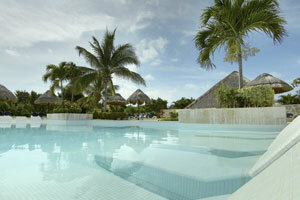 3 private pools with built-in jacuzzi and waiter services, including an infinity pool with sea views. An array of activities including yoga and aerobics, as well as kayaking, diving and windsurfing. Important notice: * Taxes included, except Ecotax "Environmental Sanitation Law/ Derecho de Saneamiento ambiental ": the amount of the tax is established by the municipal administration of Solidaridad and raises to 10 Mexican pesos per room and night for stays from October 1 to December 31, 2017 and 20 Mexican pesos for stays/arrivals from January 1, 2018. The amount is payable by the guest, to the hotel on the day of check-in. The hotel acts as an intermediary collector between guest and municipality. ** We would like to remind you that, according to national tobacco laws, smoking is not allowed in hotel rooms and in the lobby. If caught smoking, you will be charged $250 USD for room cleaning and preparation. The Premium adults-only, TRS Yucatan Hotel boast 454 fully-fitted suites with 24-hour room service. 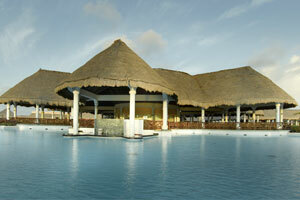 Free WiFi access for guests staying at the TRS Yucatan Hotel. Whether you prefer to stay within the hotel’s exquisite facilities or venture out to explore the surrounding areas, it will be impossible to get bored with the array of activities available. In addition to the live shows, sports and games provided by the hotel and the neighboring Grand Palladium Hotels & Resorts, TRS Yucatan Hotel stands out with its exclusive à la carte entertainment, which provides a personalized program specially made for each one of its guests. From snorkeling tours, archery, dance classes or yoga sessions, to cultural activities such as language classes, tours of the outskirts of the hotel or tequila tastings, you can do any type of activity at any time and place. Enjoy entertainment without limits! Diving (in nearby coral reefs, sink holes or Cozumel). In all the Grand Palladium Resorts, we are committed to the efficient usage of natural resources, encouraging our staff, guests and suppliers to participate in our environmental policies. The use of biodegradable products, low energy lighting, recycling of solid residues and re-use of materials that can be utilized for other purposes are a fundamental part of our policy. In order to increase living standards in the area, we also promote the use of local products and foster eco-cultural actions and learning of sustainable development. 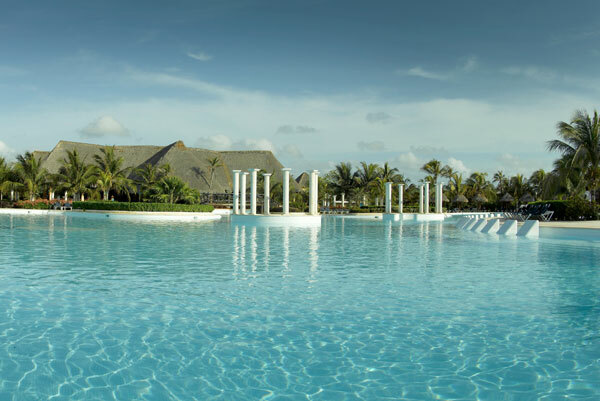 The Grand Palladium Resorts in the Mayan Riviera have been awarded the Green Globe Award and the Kuoni Green Planet Award in recognition for their environmental policies. Amongst the environmentally friendly initiatives of the Resorts, there’s a water treatment plant with state-of-the-art reverse osmosis purification system which guarantees drinking quality of tab water. The offsite waste management includes waste separation and recycling (no waste water pumped into the ocean). 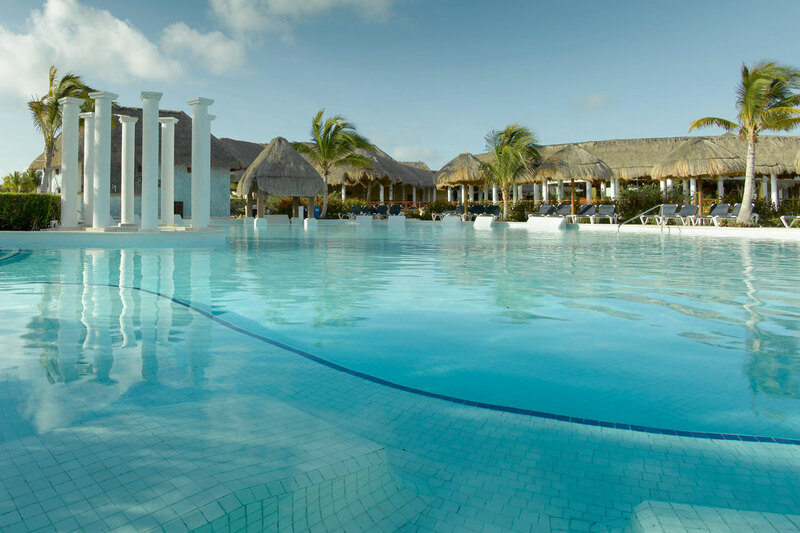 Grand Palladium Riviera Maya and Aqua Excursions bring you the best in water activities inside and outside of the hotel! Visit our aquatic activities & dive center located on the hotel's beach in the Grand Palladium Colonial section right next to the 24-hour restaurant. All these activities are for the whole family no matter what level of experience each member has. Diving courses are for people who have never dived before as well as for experienced divers looking to expand their diving skills. At the dive center you can also borrow snorkeling equipment (mask and snorkel) single and double kayaks, paddle surf boards, paddle boats, catamarans (14 ft hobbie cats) and windsurf boards at no extra cost. * These activities however require the signature by an adult for the responsibility and proper care of the equipment and you must leave your room key and a valid ID (passport, identity card or driver's license) and are returned at the end of your activity. 7 Freshwater Pools and 1 Seawater Pool. Free umbrella, sunbeds, shower and towel service. 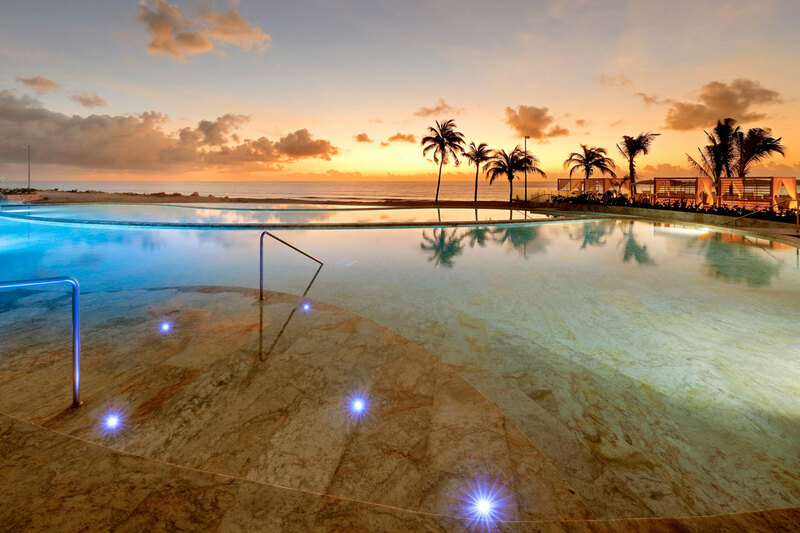 TRS Yucatan Hotel features one of the most complete Spa & Wellness centers in the Mayan Riviera. In addition to offering exclusive and personalized services, the Zentropía Palladium Spa & Wellness also features an ample gymnasium with modern exercise equipment, jacuzzi, sauna and vapor baths that will fly you to a haven of tranquility and pleasure. Pamper yourself with a luxurious massage or choose amongst a great variety of beauty treatments (additional costs and previous reservation required). The Grand Palladium Resorts in the Mayan Riviera have11 multi-purpose halls featuring all the technology and services you’ll need to celebrate your event. It also has a convention center with a total surface area of 505 m2 and maximum theater capacity of up to 600 people. Our modern facilities, advanced multimedia technology and a team of professional experts are available to successfully organize any type of event: meetings, incentives, conventions, etc. can be arranged in an exotic setting with careful attention to details. Complementing the halls, there are breathtaking gardens where you can also celebrate a wide array of activities, such as cocktails, receptions, etc.